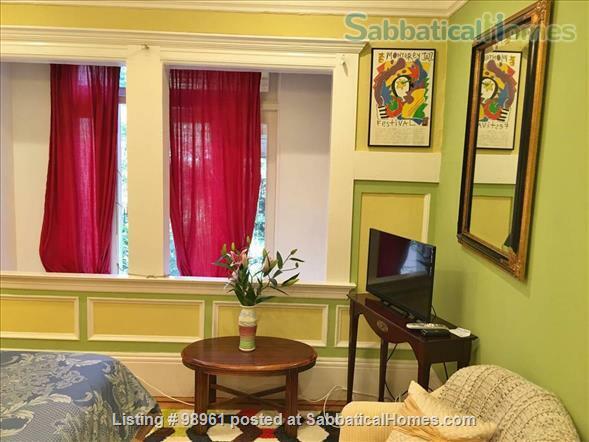 This charmingly renovated Elmwood cottage is 10-12 minutes’ walk to UC Berkeley and conveniently close to Willard Park, Whole Foods, CVS Pharmacy, public transport, and the unique stores and cafes on Telegraph Avenue and College Avenue. The cottage is set back from the street, behind a majestic old house built in 1907. 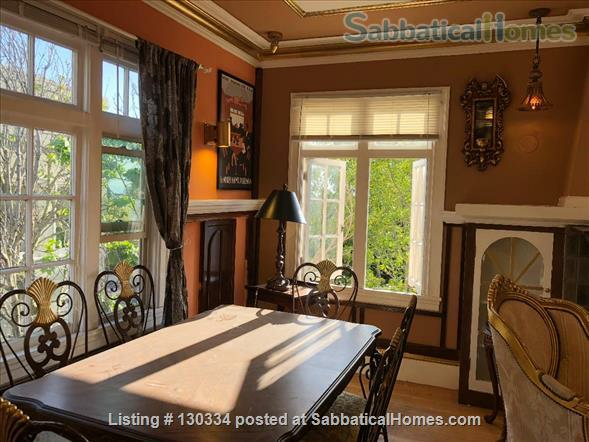 •	The cottage is stylishly furnished and decorated with vaulted ceilings, many windows – including greenhouse windows in the kitchen and bathroom – and a skylight. •	Etched glass mirrors, hardwood floors, granite and marble tile in the bathroom; indirect “mood” lighting. •	It’s small (400 sq ft) but cosy and charming, with efficient use of space – for example, storage drawers underneath the bed and recessed shelving. 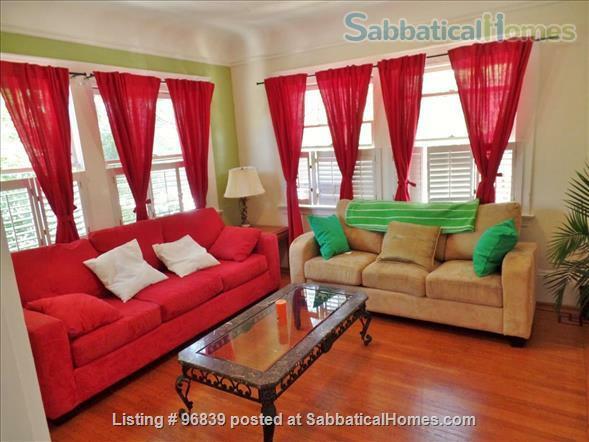 •	The living room has a comfortable sofa, coffee table and flat-screen TV. •	There’s a small work desk. Internet/wi-fi is included with the rent. A printer/scanner can be provided if desired. •	The kitchen includes a dishwasher, microwave, all cooking equipment, coffee maker, dishes, glasses, and utensils. •	The bedroom has a queen-size bed; all bedding is included. •	The bathroom has a full-size tub, over-the-tub shower, classic white Carrera marble tile walls, and even granite artwork in the floor. •	On-site coin-op laundry facilities a few steps away. •	One off-street parking space is available right outside the entrance. 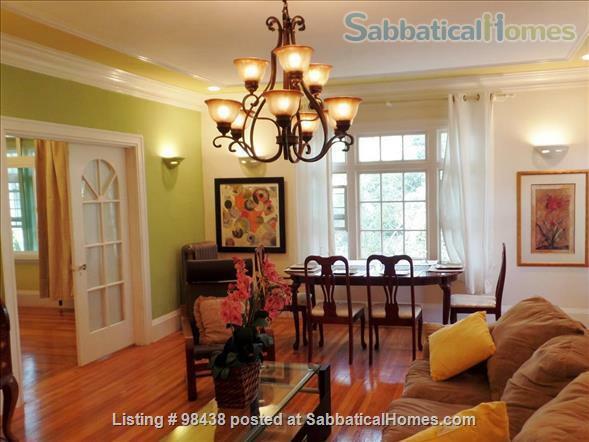 •	Located in the Elmwood residential district, 1 block from Telegraph Avenue and 2 blocks from College Avenue. •	Close to numerous interesting ethnic and specialty restaurants (Italian, Nepalese, Ethiopian, French, Japanese, burgers, pizza, Swiss-style fondue, Thai, Chinese, Korean barbecue, a Subway), coffee houses, bookstores, vintage clothing stores, music stores, and student hangouts on Telegraph Avenue. •	Large CVS Pharmacy is one block away, and Whole Foods is 4 minutes by car or a 12 minute walk (5 blocks). •	The Claremont Hotel & Conference Center is just over a mile away. •	A Walk Score of 92 classifies it as a "Walker's Paradise" - you don't need a car for everyday errands. •	Buses on Telegraph or College Avenues take you to downtown Berkeley, all 3 nearby BART stations (BART = Bay Area Rapid Transit), Oakland and San Francisco. •	Freeway access is available either at Telegraph Avenue & 55th Street (about 2 miles) or Ashby Avenue (about 3 miles) from where you can drive to San Francisco, Oakland, Marin County & the Golden Gate Bridge, the coast and Carmel/Monterey, Napa Valley and the Sonoma wine country, and Lake Tahoe/Reno. •	Twenty minutes driving (outside rush hours!) will take you to San Francisco across the Bay Bridge, or – if you take BART from any of the 3 nearby BART stations – it’s about a 20 minute ride to SF. •	No smoking anywhere in or around the cottage! A Berkeley City ordinance prohibits it in multi-unit living spaces and common areas (there is another adjoining cottage). This policy applies to smoking of all kinds, including "vaping" (use of e-cigarettes). •	Please, no parties or loud noise – this is generally a quiet residential neighborhood, and we want to keep it that way. Quiet time is from 10:00 pm to 8:00 am. 30 night minimum . A stay of 14-30 nights can be booked but only via Airbnb; see link below.